NDP MPs say they aren't worried about their leader's ability to keep the seat. NDP Leader Jagmeet Singh speaks at an event in Burnaby, B.C., on Aug. 8, 2018. SURREY, B.C. — Jagmeet Singh's name drew squints, blank stares and dismissive shrugs when HuffPost Canada visited the riding of Burnaby South this week. The electoral district is the next battleground for the NDP leader, who will be nominated as the party's candidate there on Saturday after current New Democrat MP Kennedy Stewart officially enters the Vancouver mayoral race and resigns his seat. But for Singh, a parachuted candidate from Ontario, the riding may not necessarily be a lock. It's the safest seat the party has contemplated — passing over a more difficult fight in Montreal's Outremont riding, where former NDP leader Thomas Mulcair vacated his seat, or any of the six other ridings Singh could have contested since becoming party leader last October. But on the streets of Burnaby South, a city to the immediate east of Vancouver, residents' reactions seem to suggest that Singh has his work cut out for him. "Does the name Jagmeet Singh mean anything to you?," HuffPost Canada asked. "No, sorry," responded an 18-year-old man named Alex, who was waiting for the Skytrain. Two women, Alexandra and Barbara, who were walking along Kingsway Avenue, the riding's major thruway, also didn't know who Singh was. "No, no. What's he about?" A man named Anch shook his head. "Jagmeet Singh...? No." A woman named Rita, who was rushing out of the grocery store to attend to dinner guests, pursed her lips as she walked towards her car. "I have not heard of Jagmeet Singh," she said, pausing. "I'm not up on the politics." Two parking lanes over, David Iwaasa, recognized Singh as the leader of the NDP but said he wouldn't vote for him. "Probably not," he said with a laugh. "I'm not an NDP supporter." One woman who didn't want to give her name said she'd been called so often by the NDP to secure her support for Singh that she was turned off and planned to stay home or cast a ballot for someone else. Balbir Singh, an elderly gentleman who was walking out of the Metropolis shopping centre, told HuffPost he was a Liberal supporter in his heart but he would likely vote for Singh. "It's not that he's Punjabi, but he's the right kind of person, you know? ... He's educated... . He's become a leader of the party, so he might have some qualities. Otherwise, you can't become a leader," Singh said. "He's a lawyer by profession, and he studied here and he speaks good English, so everything is fine." Still Singh flagged one issue, he said, that has people talking. "He doesn't live here right now, so that is the main concern of the people, that he doesn't live here." Across the street, New Democrat member Ward Edgar told HuffPost he also has mixed feelings about the former Toronto-area MPP's running in Burnaby South, a riding "he's never grown up in and doesn't really know the true concerns of." "I don't agree with that. I think someone that has lived there, grown up there, knows the concerns, knows the neighbourhood, knows the area, should be running... ."
Edgar suggested the party was gambling in a high-stakes game by inserting Singh in the contest. "I think if he loses, he's in trouble and the NDP party federally are in trouble, and that is the risk that I think they are taking... . I don't think they should be doing that right now... . I think this may backfire." If the party thinks the risk of having Singh run in Burnaby South is high, they are not saying it out loud. "But at the same time, I'm ready to fight this byelection with a Liberal candidate, because I'm quite sure we can beat him, or her." Vancouver MP Don Davies said his former colleague's riding is a pretty safe bet for the NDP leader. "It is a solid B.C. 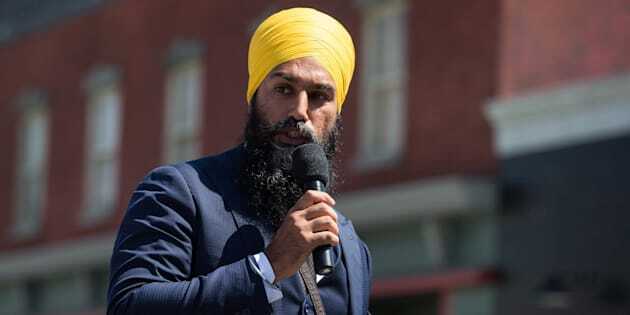 riding, the issues favour us, you know, Kinder Morgan [pipeline expansion] is very unpopular, Jagmeet has got a great message, and the community is ready to have someone go to Ottawa and continue a strong New Democrat voice." Davies said he wasn't ready to contemplate about what would happen if Singh lost. "There is a rule in politics that you don't speculate, so I won't speculate — and he's going to win." Quebec MP Christine Moore said Singh understands the stakes involved. "He is going to do the work that is necessary to win," she said. Stewart, she also noted, had a great local organization, a team of volunteers and he's leaving the riding in a good shape. "Until [there is a byelection result], there is no point of engaging in 'what if this' and 'what if that.' We'll deal with it if it happens." Her colleague, Ruth Ellen Brosseau, told reporters the leader had chosen to run in Burnaby and would be working "really, really hard." "Obviously, there is work that has to be done on the ground. I wasn't aware that people were not able to identify a photo of him, but I could tell you when he was in my riding, I took him to an outfitter and people threw down their coolers and they ran at him," she said. Once the byelection is launched, Singh will be out and about, so name and face recognition will not be an issue, Ontario MP Tracey Ramsey said. "At the beginning of a campaign, I don't think that is unusual at all. "We are not even entertaining that [the idea that Singh might lose]. We are planning to win. He is working hard. We are working hard. We are building a plan to win ... and we are confident in that." NDP MPs Ruth Ellen Brosseau, front right, and Tracey Ramsey, back, listen during the second day of a three-day NDP caucus national strategy session in Surrey, B.C., on Sept. 12, 2018. Quebec MP François Choquette said he was confident his leader will win but also realistic about the task. "Both [pending byelections in Burnaby South and Outremont] are challenges, but they are challenges we will surmount," he said. "We'll be there, and we'll work very hard. We don't want to let go of these two ridings." Prime Minister Justin Trudeau has six months to call a byelection after Stewart vacates his seat, which is expected on Friday. There are several other byelections Trudeau needs to call, and he may wait to group some contests together. The first is the late Conservative MP Gordon Brown's Ontario riding in Leeds–Greenville–Thousand Islands and Rideau Lakes. It must be called before Oct. 30. An election in Mulcair's Montreal seat must be called by Jan. 30, 2019. Ontario Conservative Peter Van Loan said earlier this summer that he would be stepping down as the MP in York–Simcoe on Sept. 30. Montreal Liberal MP Nicola Di Lorio, in Saint-Léonard–Saint-Michel, announced earlier this year that he plans to resign, but he has yet to officially do so.